化石講場-Fossils Board 亞洲首個古生物/恐龍/化石的華語討論區 - [恐龍新聞 Dinosaur News] - 美國蒙大拿州發現霸王龍幼體化石 - powered by Discuz! Paleontologists digging in Montana have hit the dinosaur jackpot. They've uncovered what appears to be an elementary-school-age Tyrannosaurus rex, they announced Thursday (March 29). The researchers found the fearsome beast's remains in Montana's famous Hell Creek formation, a rocky expanse chock-full of dinosaur-age fossils. Despite the site's rich assemblage, the past 100 years have yielded fewer than five "decently complete juvenile T. rexes," said Kyle Atkins-Weltman, an assistant fossil preparator at the Biodiversity Institute and Natural History Museum at Kansas University, who is helping prepare the tyrannosaur. Kris Super, an assistant student preparator also at the Natural History Museum, found the young T. rex's fossils in June 2016. 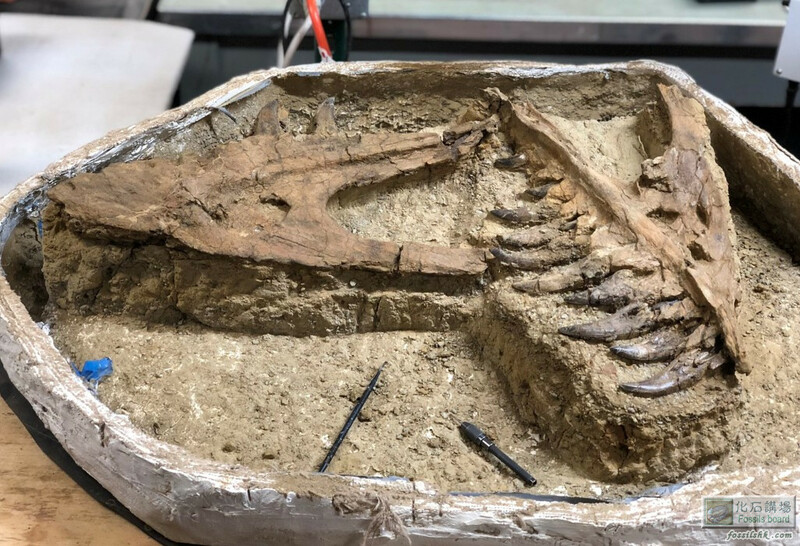 But his team only had time to unearth the dinosaur's ilium (the upper part of the pelvic bone), so they weren't sure what species it was until they returned the following summer and dug up its recognizable teeth and skull. This dinosaur, as well as other fossils recovered from the same spot at Hell Creek, will keep its discoverers busy for a while, David Burnham, a preparator of vertebrate paleontology at the Biodiversity Institute, told Live Science. The rock slabs they excavated also include a nearly complete turtle and pieces of fish and other dinosaurs. They even found the jaw of a placental mammal, Burnham said. These prehistoric animals likely died in a "quick, cataclysmic event," Burnham said. "The storms were huge because the temperatures were warmer."